On the aft deck Samara is equipped with a remote controlled hydraulic submersible platform, this enables the launch and retrieval of the custom designed 4.1m tender. 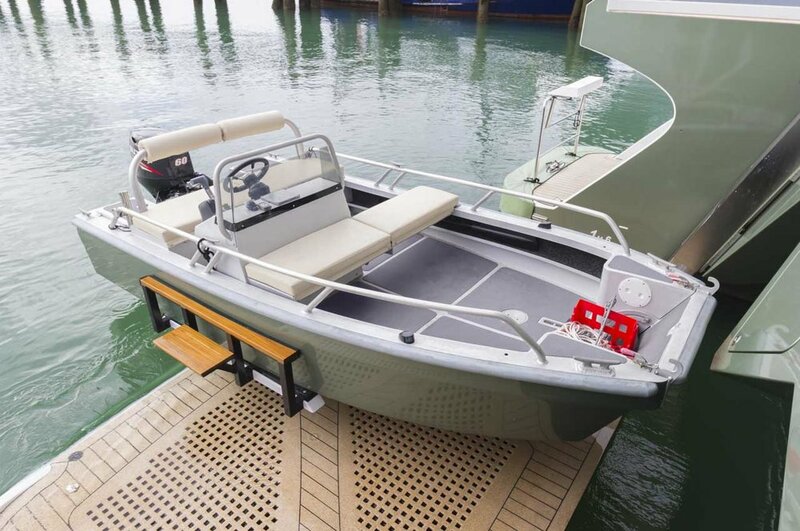 At the water line, the tender can be floated on or off its holding cradle, making launch and retrieval easy. Once retrieved by the cradle, the platform is lifted flush with the aft deck, and the tender can be rotated into its stowed position. The cradle can also be removed when the tender is absent, leaving the deck clear. Missions on terra firma are enhanced by the landing craft inspired tender, being constructed from aluminium gives it the durability needed to transport two motorbikes or push bikes between Samara and the beach. 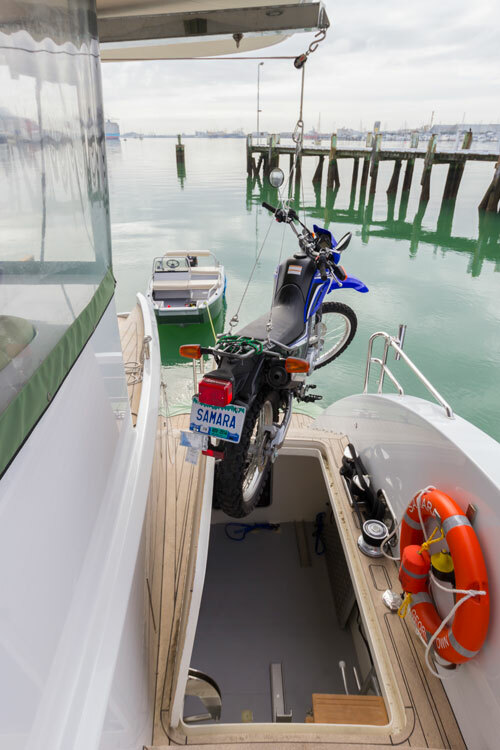 A crane is discretely built in to the aft deck overhead for lifting the bikes from their lockers onto a dock, or loading the tender while its securely held by the cradle. At the beach the tender can be driven up to the sand, the gate at its bow becomes a ramp, and the bikes can be rolled off. The transom face just forward of the lifting platform conceals two lockers, each designed to house a 5m sailing kayak. Kayaks are easily launched by sliding out directly onto the hydraulic lifting platform. Perfect for relaxed adventures at water level, should one desire to go deeper a dive compressor is at hand along with ample space to store dive gear.